5. Bake at 350 for 20 mins or until they're tender to your liking - don't cook the kale for more than 20 though or they'll burn! 8. When the onions are done, place your turkey slices on the pan and let them warm up and brown a bit. They taste great with the bit of leftover onion juices in the pan. 9. 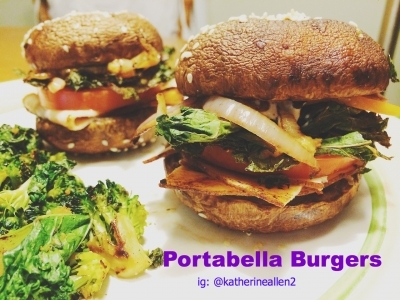 Remove the mushrooms and kale from the oven and fill them like a burger, then enjoy!